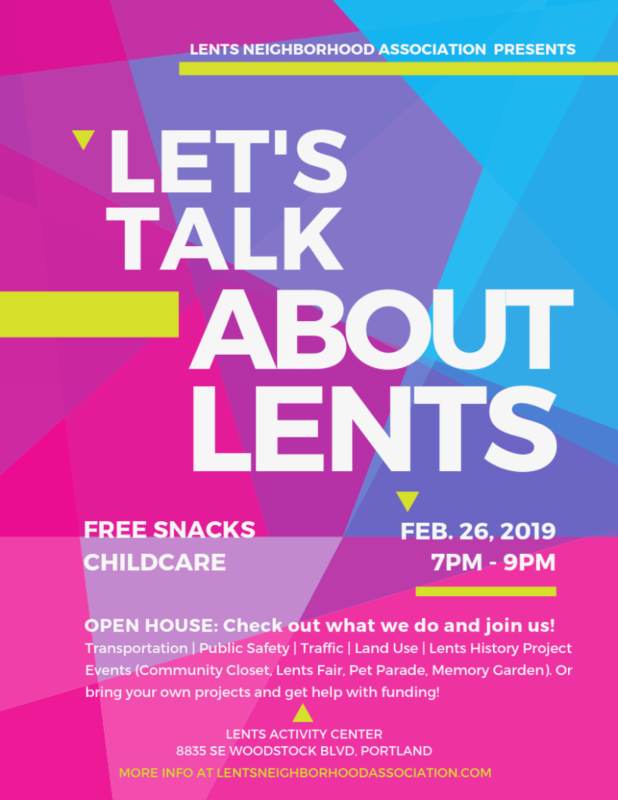 OPEN HOUSE: Let’s talk about Lents! What improvements do you want to see happen in Lents? Are you interested in working toward making them happen? At our upcoming monthly meeting on Tuesday, February 26, starting at 7 PM at the Lents Activity Center, we will devote a considerable portion of the agenda to exploring our committees and what they’re currently working on, as well as what might be coming up. This will be OPEN HOUSE style. You can walk around and check out each committee and join any work session(s) that seems appealing to you. OR you can bring your own project and receive help with obtaining funding to make it happen! Angela Previdelli, Grant Specialist with East Portland Community Office will be there as a resource. This meeting is open to the public. Everyone is welcome to attend! We serve food and offer childcare and interpretation at no charge to the community. Motion from Land Use Chair re: vacating a portion of SE Malden Street, SE Malden Court, SE Lambert Street and SE 89th Avenue. COMMITTEE OPEN HOUSE: Get involved! We will devote a considerable portion of the agenda to exploring our committees and what they’re currently working on, as well as what’s on the horizon for each one. This is a great opportunity to learn more about what we do and get involved with issues that are important to you! Ever wonder what the heck are these Neighborhood Associations? What is the Lents Neighborhood Association Board, and what do I need to know to decide whether to run for office in the upcoming election September 25th? Info to make smart decisions about running for an open board position at the Annual Meeting on September 25th. 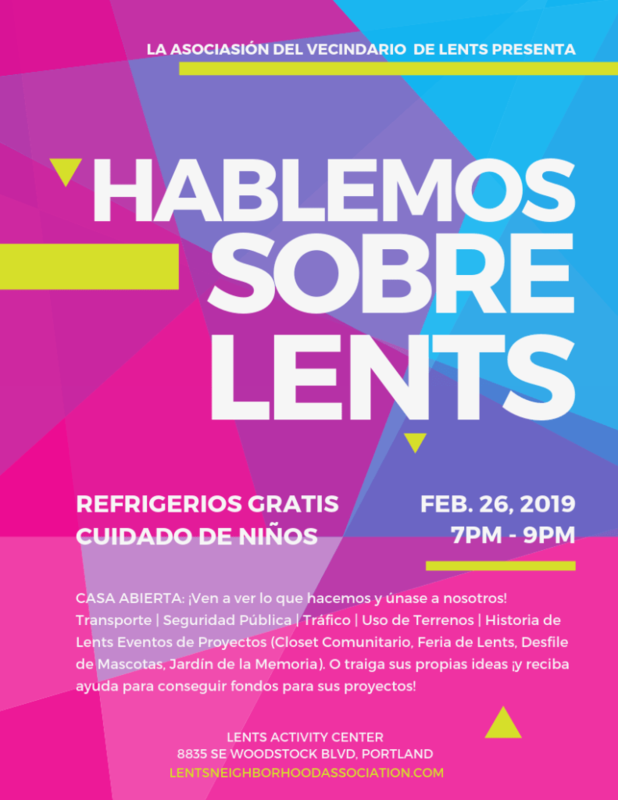 It’s time for all of us to come together to learn the nitty gritty about our Neighborhood Association and how each of us can contribute to livability in Lents and progress via the LNA. We encourage all LNA members who care about the well-being of Lents to join your neighbors at this meeting. There will be a special meeting of the Lents Neighborhood Association board to appoint members to vacant board seats. The special meeting will take place at the Lents Activity Center, 8835 SE Woodstock, on July 24 at 6 pm. The regularly scheduled general membership meeting will follow at 7 pm, which will include ratification of the new board members. If you are an LNA member and wish to be considered for appointment to a vacant seat on the board or have questions, send an email to lentsneighborhood@gmail.com or use the “Contact LNA” form at www.lentsneighborhoodassociation.com. Tell us about yourself and why you want to join the LNA board. Open seats include transportation (until 9/’19), secretary (9/’18), chair (9/’19), public safety (9/’18)and at-large 9/’18 and 9/’19).